Adored and treasured by celebrities and customers alike, the Riva Hoop Ring is the ultimate every day diamond ring. Its fluid shapes are reminiscent of beautifully shaped natural objects found along the shore. The diamonds in the Riva Hoop Ring are pavé set by hand and are ethically sourced via suppliers that adhere to the Kimberley process, preventing the distribution of conflict diamonds. 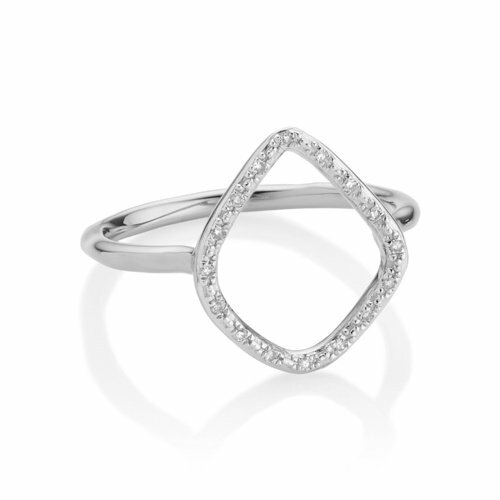 The Riva Hoop Ring can be worn casually or dressed up for evening sparkle. Our jewellery is hallmarked in the UK Assay Office, this is a guarantee to our clients of the purity and quality of the metals used. The Riva Hoop Ring is available in Sterling Silver, 18ct Yellow and Rose Gold Vermeil. The Vermeil technique was established in France in the mid-18th century and involves the plating of Yellow or Rose Gold on Sterling Silver to produce a rich, qualitative finish. Influenced by the Italian riviera, the Riva silhouettes reflect found objects along the shore. RITA ORA WEARS THE RIVA HOOP RING WHILE PERFORMING AS WELL AS OUT AND ABOUT IN LONDON. SHE HAS COMPLEMENTED IT WITH THE ALMA RING.